Above: Seven hills of Kataragama with Kirivehera dagoba seen at left. Below: Ashta Phala Ruhu Bodhi tree and railing in Mahadevale courtyard. Although, strictly speaking, the word Kataragama refers to the place-name of a certain area in southern Sri Lanka, yet the mere sound upon anyone's ear reminds one of Kataragama Deviyo who presides there. Even among learned scholars, it is a matter of controversy whether the place was named after the god or whether the god came to be called by the name of the domain where he holds sway. In any case, since ancient times an inseparable connection between the god and his domain has existed. Scholars also argue whether God Kataragama is Hindu or Buddhist. Some say that references to him found in Hindu canonical texts like the Atharva Veda (900-500 BC) show that he belongs to the Hindu pantheon. On the other hand, the Maha Samaya Sutta also refers to him as the Sanat Kumara or Perpetual Youth. From this one may conclude that he is now a Buddhist deity as well.  Many names and epithets have been used down the ages to invoke and identify the Kataragama god. His feats are celebrated and remembered in numerous poems and texts preserved in the Sanskrit, Pali, Sinhala and Tamil languages. Sinhala tradition recalls that during Lord Buddha's time Kataragama was ruled by a just king whose name Mahasena means 'Who has a great army'. This same name in ancient mythology refers to wargod Karttikeya, the fiery youth born of the Pleiades constellation who took birth on earth to defeat a superdemon who was oppressing gods and mankind alike. 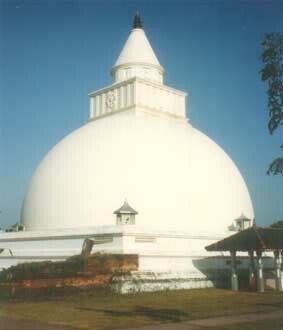 Kataragama, some say, is Karttikeya-grama, the village of wargod Karttikeya-Mahasena. According to the chronicles of Sri Lanka, there are sixteen places hallowed by visits of the Buddha. Time-honoured tradition says that Lord Buddha 'the Fully Awakened One' visited Kataragama on His second of three appearances in Lanka. 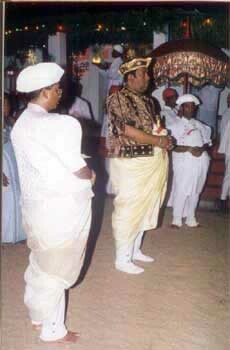 King Mahasena then welcomed the Lord and his retinue with due honours and found delight in His sublime Teachings. King Mahasena himself took refuge in the Triple Gem on the spot and vowed to protect and promote the Buddhist religion and its followers for all time to come. 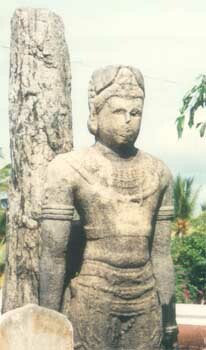 Some modern scholars believe that Kataragama Deviyo was a human chieftain who later was elevated to divine status. But local oral tradition insists that good King Mahasena is still alive and reigning in Kataragama even today. Many Buddhists believe that the God or King of Kataragama is actually a great bodhisattva or 'awakening being' vested with extraordinary ability to help those who appeal to him. Indeed, to this day most of Kataragama's devotees are Sinhala Buddhists. If one examines the ritual procedures practiced at the Kataragama Maha Devale, one finds that the theistic rituals rest upon a foundation of buddhistic motivation from which the twin virtues of wisdom (Pali: ñana) and compassion (karuna) arise in creative interaction. 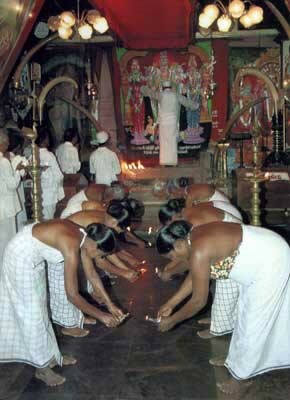 It is also true that the modes of worship incorporate features that are common to other faiths of South Asia includilng Hinduism. Among examples are concepts of faith in a personal divinity or spirit abiding within oneself. Practising Buddhists find no contradiction in this profound paradox. Besides the pujas that are held daily, weekly, etc., at the Maha Devale, there is also the strategically important Esala Perahera or ritual procession conducted nightly during the waxing moon of Esala (July-August). It is the crowning feature of the Esala festival celebrated in fulfillment of the kap hitaweema or vow-fixing ceremony held at the Maha Devale forty-five days before the festival. The exact dates are astrologically determined. From Kirivehera the procession returns south past the Maha Devale to Lady Valli's devale-residence for a visit before returning to the Maha Devale for the Alatti Puja or lamp worship performed by the alatti ammas. The following morning the festival concludes with the diya kæpeema or Water-cutting Ceremony that is conducted upon the bank of the Menik Ganga just upstream from the Maha Devale. 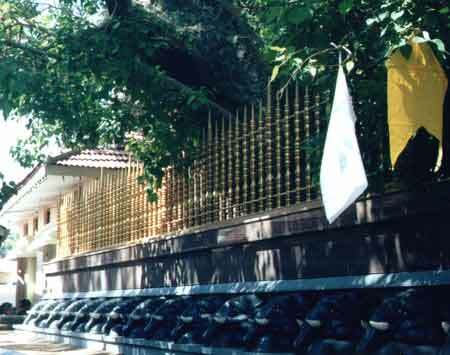 Of the water sanctified in the Water-cutting Ceremony, a portion is also offered according to tradition to the Ashta Phala Ruhu Bodhi tree next to the Kataragama Maha Devale. 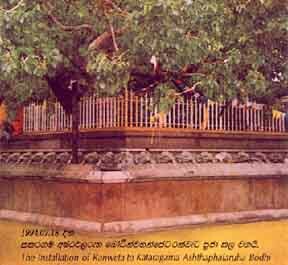 Year-round on Saturday mornings there is also the nanumura mangalya or ceremony offering Menik Ganga water to the sacred bodhi trees, thereby ritually maintaining King Mahasena's pledge of allegiance to buddhistic principles. The Esala festival reaches its climax on the evening of the full moon when the Maha Perahera ritually re-creates teh career of the Bodhisattva-King Mahasena. Not surprisingly, it begins with the chanting of pirith by Buddhist monks to invoke the blessings of the Triple Gem upon the ritual proceedings. The officiating monks from Kataragama Kirivehera Maha Rajaviharaya also sprinkle pirith pæn or sanctified water upon the Basnayake Nilame or Chief Official and his retinue to mark the occasion as sacred to Buddhists. In a colourful and joyous yet dignified torchlit procession, one trained tusker elephant carries on his back a relic-casket symbolising Lord Buddha's presence while another tusker follows carrying King Mahasena's presence as contained within His six-cornered yantra device. The and their ritual entourage proceed at a stately pace to Kirivehera some 560 metres north of the Maha Devale. There the monks of Kirivehera receive the Basnayake Nilame who takes refuge in the Triple Gem and accepts the five cardinal precepts. Gilampasa Buddha Puja follows in which the eight permitted drinks are offered as refreshment for the Lord and His monastic community. With the pirikara or offering of requisites to the Sangha, the full Buddhist ritual enactment is completed and the ten directions of space are filled with the blessings of God Kataragama and the Triple Gem. This article first appeared in the July 1992 issue of Bhakti .